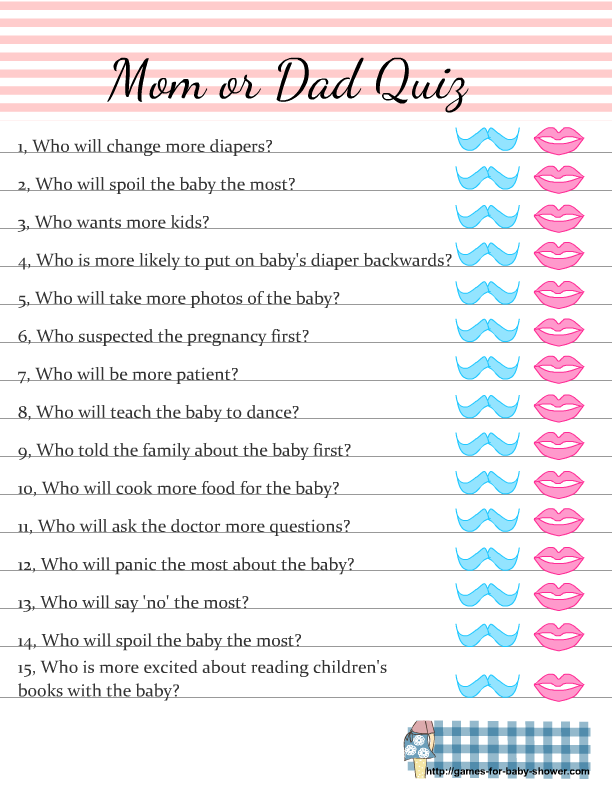 Mom or Dad quiz is a fun baby shower game and it is just like the honey do's game that we play on bridal showers. Ask the parents-to-be that who is ready to do the tasks mentioned in this quiz sheet and then test the guests if they can guess it correctly or not. I have made these Free printable Mom or Dad Quiz worksheets in three different colors. You can print this game in any color of your choice. This is also an ideal game for co-ed baby showers where both parents-to-be are present. How to Play: You can either ask the parents-to-be to give answers to this quiz one day before the baby shower or they can play this game while all the other guests are playing. Give each guest a copy of this printed game and ask them that in their opinion who will do a certain task mentioned on the quiz card. Ask them to circle moustach if they think that dad-to-be will perform that task or circle the lips if they think that mom-to-be is more likely to do that. Match the answers to the one given by the parents. The guest with most right answers will be the winner. This is the first free printable color for this fun and interesting mom and dad quiz. You can print this game in this gender-neutral yellow color for your girl baby shower, boy baby shower, on a baby shower where parents-to-be do not know or do not want to disclose gender or the baby or at a baby shower that has a theme to match the yellow color more. Click on the image given above to get the bigger version of this Mom and Dad baby shower quiz in pink color. There are 15 interesting questions for the guests to answer. This is the free printable Mom or Dad quiz in blue color. Just click on this thumbnail and a bigger printable image will open up, that you can save. This is a perfect game for boy baby shower.